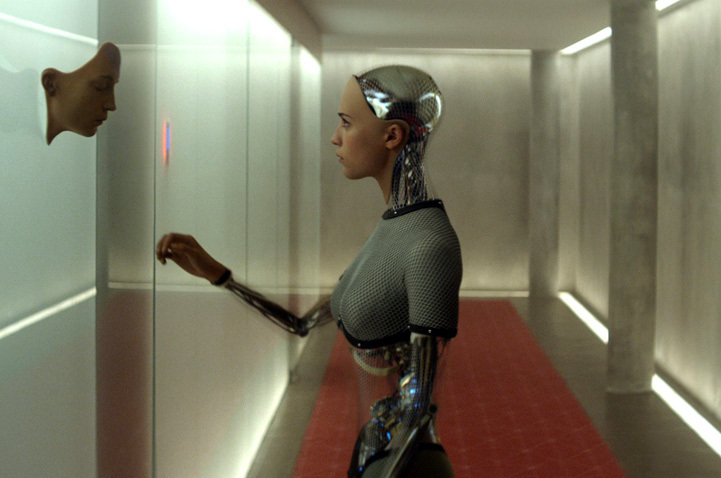 Alex Garland made his name writing about humans searching for the perfect idyll. His 1996 debut novel “The Beach,” about backpackers searching for an Earthly paradise, was an international bestseller and later a Danny Boyle film. He subsequently wrote two screenplays for the British director — “28 Days Later” and “Sunshine,” then chased down the rights to adapt Kazuo Ishiguro’s dystopian alternative reality tale “Never Let Me Go.” His reboot of “Judge Dredd” in 2012 was set in a future where mind readers and technology allow individuals to make judicial decisions. In all these works, the biggest obstacle involves flawed moral codes. Caleb (Donhnall Gleeson) wins a work competition to spend a week at the mountain retreat of his boss Nathan (Oscar Isaac), an internet search engine billionaire (a scenario that echoes stories of Google buying artificial intelligence companies for hundreds of millions of dollars). Gleeson is making quite a name for himself playing everyman characters stumbling into extraordinary situations, discovering he can time travel in “About Time” and joining Frank Sidebottom’s band in the off-kilter rock comedy “Frank.” Appropriately enough, the house that serves as the single location for “Ex Machina” is in a tranquil, secluded setting of the type where Sidebottom liked to record his albums. Caleb is a tricky character to play: He has the brains to standout in the biggest internet company in the world, a degree of wonderment when meeting the artificial intelligence machine, combined with a gullibility that gives him total faith in his boss. Still, it’s Isaac’s Nathan who becomes the standout character. Heavyset, with a shaved head and a healthy beard, when we meet him he’s boxing a punch bag. He looks more like the archetype of a religious leader from one of the Abrahimic religions than tech genius. That perception is reinforced when Caleb describes the work that Nathan is doing as being in the realm of the gods. It’s soon apparent that there’s a parallel being made to the Adam and Eve tale, with Nathan being the omnipresent creator watching over events through the closed circuit television in the house, and Caleb being the prophet called to spread the word. 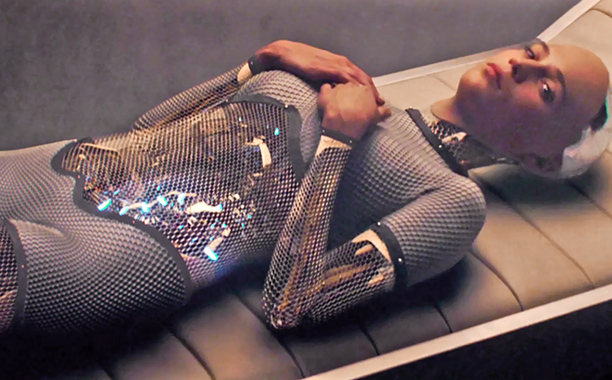 His test is Ava, the artificial intelligence being seductively portrayed by Alicia Vikander. In meetings that take place over the course of seven days, she nimbly persuades Caleb that she has human consciousness despite her origins, and it’s tough not to believe her. The money on her character’s special effects has been well spent. Half machine, half super-model, Ava is at once cold and stiff while hinting at her underlying emotions. The knowledge that she’s a computer from the outset, separates her from her cinematic predecessors in “Blade Runner,” where Harrison Ford’s Deckard starts from the belief that Sean Young’s Rachael and Daryl Hannah’s Pris are human unless proved otherwise. Instead of heaping ambiguity onto his robotic character’s identity, Garland gives us a modern day Frankenstein. The director ensures this chamber piece of moral conundrums never seems too heavy-handed; his fluids camera roams through each room so that at no time does the theatrical set-up feel like a limitation. The one-location film is traditionally the preserve of first-time filmmakers, which admittedly is Garland’s status, but he executes it like a vet — with precise, robotic, pacing. The surprises are delivered as cleverly conceived pay-offs. Still, not everything flows so effortlessly. Some clunky exposition involving Caleb’s poor communication with the outside world distracts from the events at hand. The fourth character in the house — Nathan’s mute assistant, Kyoko (newcomer Sonoyo Mizuno) — is signposted as being a MacGuffin and nothing revealed about her background comes as a surprise. That being said, this is a worthy addition to the wealth of sci-fi classics from Fritz Lang to Stanley Kubrick that explore the prospects of machines outwitting their human counterpoints. The question of who has the upper hand remains open-ended, but Garland provides some compelling ways to keep asking it. 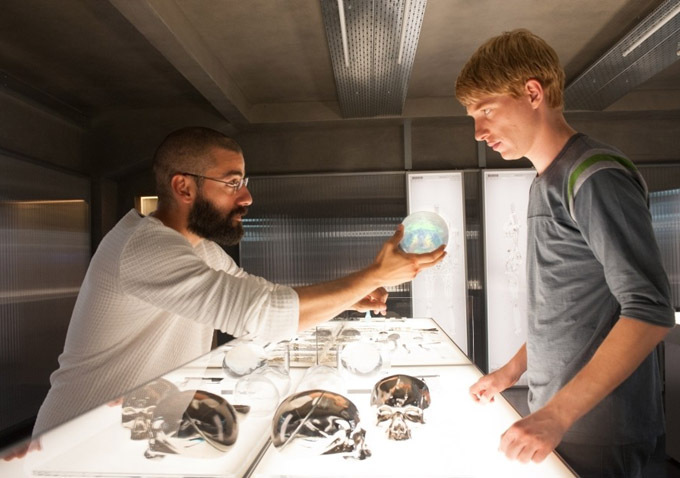 “Ex Machina” opens in limited release this Friday.